BOSTON, Mass. - Sophomore Skylar Fontaine scored the game-tying goal with three minutes remaining in the third period and classmate Brooke Hobson won the game at 2:51 of overtime to send the No. 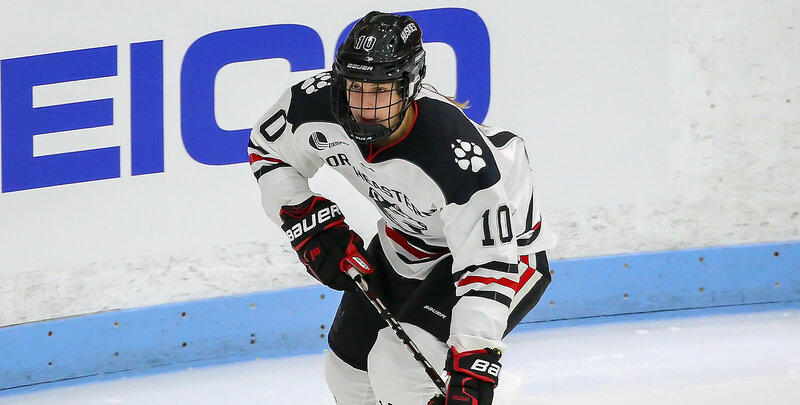 3 Northeastern women's hockey team to a dramatic 2-1 victory over Vermont on Friday evening at Matthews Arena. The Catamounts (7-15-4, 5-12-2 WHEA) took the lead through Val Caldwell's goal at 2:11 of the second period, and the lead held late into the third before Northeastern (18-3-3, 16-2-2 WHEA) staged a dramatic comeback to improve to 9-0-0 at home in Hockey East games. Fontaine intercepted a pass in the defensive zone, skated up the right wing with speed, and shifted backhand to forehand before lifting a shot inside the left post to level the score at 17:00 of the final frame. Then, nearly three minutes into overtime, Fontaine's defensive partner, Hobson, rifled a shot off the right post and into the back of the net following a beautiful centering pass from senior Tori Sullivan to complete the comeback. The goal gave NU its second overtime victory of the season following a 5-4 extra-time triumph over No. 4 Boston College on Nov. 27. Sophomore Aerin Frankel stopped 15 of 16 Vermont shots to move to 12-0-0 in league play this season. UVM's Melissa Black was the tough-luck loser despite a 35-save effort at the other end. The teams will wrap up the regular season series on Saturday at Matthews Arena at 2 p.m.